Solar pool systems use sunshine - a free source of energy - to heat the water for your pool. With a Smart Solar Solution solar pool system, you also receive the high-quality customer service and licensed plumbers of NW Mechanical, based here in Seattle. What are the benefits of having a solar pool system? Here’s what our experts at NW Mechanical have to say. Having a pool you can use all year round sounds like a piece of heaven, right? Not only will you experience warmer water all summer long, but you will also start using your pool sooner in the spring and later in the fall. Whether you’re an early morning swimmer or have kids that like to splash in the pool for hours, solar is the answer! If you have a pool, ask yourself — how many days would you have used your pool last year if it was just a little bit warmer? 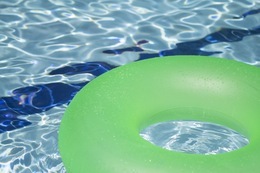 By adding more days to your swim schedule, you add value to your investment in a swimming pool. Solar on cloudy days, in rainy Seattle? Solar pool systems can heat your pool water on cloudy days, utilizing the free solar power even better than many other solar systems, just not as much as on a sunny day. Seattle receives about 70% of the annual solar potential that the Los Angeles, California area receives, even though at first thought one might think that Los Angeles would far exceed our famously rainy area's potential. Solar pool systems are able to absorb heat from the sun's rays from any direction so no matter where the sun is in the sky, no matter how few sunrays are shining, the solar pool system will absorb them and utilize them to heat the water for your pool, with no utility bill sent to charge for that heat. Solar pool heating eliminates the need to burn fossil fuels for convenient swimming. This limits the greenhouse effect saves gas for essential uses and reduces particulates in the air. If combined with a pool blanket, a FAFCO solar pool heating system can save you thousands of dollars on your energy bill, while being good to the environment. As energy costs continue to increase, the financial benefits to you will only increase - sunshine will remain free. With solar pool heating, there’s no heater unit to maintain, and essentially no moving parts. Your swimming pool pump and filtration system do all the work to move the water through the solar piping. NW Mechanical’s innovative designs are durable and are made to be maintenance-free throughout their lifetime. That sets you up for more swimming and less fixing! If you’re ready to jump on the solar train, give NW Mechanical a call today for a quote. It’s quick and easy to get started. Solar pool systems use sunshine - a free source of energy - to heat the water for your pool. With a Smart Solar Solution solar pool system, you also receive the ​high-quality customer service and licensed plumbers of NW Mechanical, based here in Seattle.